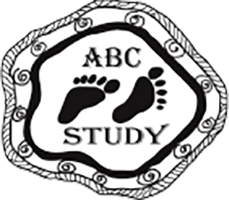 The aim of the Life Course Program is to relate life events beginning in the womb to later health and wellbeing. The Life Course Program provides valuable knowledge on the health and wellbeing of people living across the Top End. The Aboriginal Birth Cohort Study (ABC) is recognised as the largest and longest running Indigenous birth cohort in Australia. As part of the Life Course Program at Menzies, the main aim of the study is to assess the effect of early life factors, birth and childhood, on later physical and mental health, and to examine which factors influence these across the life course. The Life Course team was the 2015 winner of the Charles Darwin University Vice Chancellor's award for Exceptional Performance in Research.